I’ve been putting off writing a second post on Lordstown for a month now. I really wanted to talk about the actual work that Lordstown’s autoworkers were asked to do by General Motors; the structural changes to their jobs on the production line. Stanley Aronowitz’s book, False Promises, describes a lot of these changes, and I’ll link to a good passage below. I haven’t had time to finish Aronowitz’s book and I honestly can’t say when I’ll have time to get back to it. I’d kind of felt as though I’d committed myself to looking at Lordstown, and it was stopping me from blogging about other things that I’ve spent the past month reading about. So, for the time being I’ll compress my Lordstown post into this one note and get back to some other topics. At Lordstown, efficiency became the watchword. At 60 cars an hour, the pace of the work had not been exactly leisurely, but after GMAD* came in the number of cars produced almost doubled. Making one car a minute had been no picnic, especially on a constantly moving line. Assembly work fits the worker to the pace of the machine. Each work station is no more than 6 to 8 feet long. For example, within a minute on the line, a worker in the trim department had to walk about 20 feet to a conveyor belt transporting parts to the line, pick up a front seat weighing 30 pounds, carry it back to his work station, place the seat on the chassis, and put in four bolts to fasten it down by first hand-starting the bolts and then using an air gun to tighten them according to standard. It was steady work when the line moved at 60 seconds an hour. When it increased to more than 100 cars an hour, the number of operations on this job were not reduced and the pace became almost maddening. In 36 seconds the worker had to perform at least eight different operations, including, walking, lifting, hauling, lifting the carpet, bending to fasten the bolts by hand, fastening them by air gun, replacing the carpet, and putting a sticker on the hood. Sometimes the bolts fail to fit into the holes; the gun refuses to function at the required torque; the seats are defective or the threads are bare on the bolt. But the line does not stop. Under these circumstances the workers often find themselves “in the hole,” which means that they have fallen behind the line. *GMAD stood for General Motors Assembly Division, which was the new efficiency program GM was testing at Lordstown Assembly to try to compete with foreign competition in the early 1970s. What’s interesting to me about this is just how much GM’s ability to compete with Japanese cars was reliant on the willingness (and capability) of Lordstown’s workers to go along with this intensification of the production line. It says a lot about why the workers’ reaction to this, the “Lordstown Syndrome” that the media latched onto, seemed such a threat to the auto industry, and to the United States’ economic power in the 70s. Aronowitz’s book, False Promises: The Shaping of American Working Class Consciousness, is a broader New Left critique of organised labour, but the first chapter focuses on Lordstown, mostly through Aronowitz’s own interviews with autoworkers. Aronowitz argues that labour unions are inherently conservative and restrictive to any real working class power. That’s quite a significant part of New Left thinking, and it’s very relevant to reform movements within the United Mine Workers in the late 1960s and early 1970s. The Black Lung Association and Miners For Democracy both formed out of dissatisfaction with the UMW. Like in the quote above though, what’s really significant to me about this critique of labour is the focus on the types of job and the physical and mental content of work. The disconnection of the AFL-CIO, or of Tony Boyle’s UMW administration, from their members’ labour is really the starting point for looking at work and the labour movement in the 1970s. 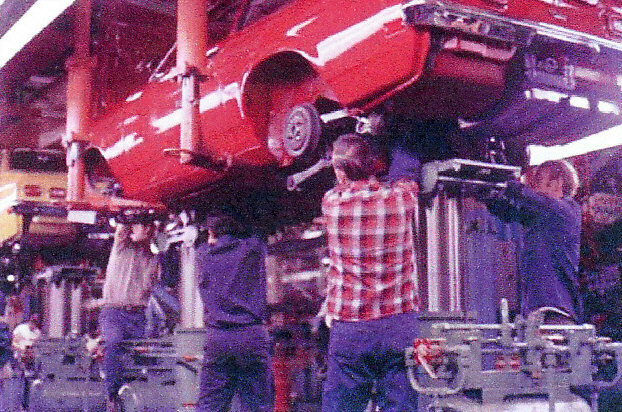 Lordstown workers assemble a Chevrolet Vega in 1971. Image from Wikipedia. In 1971, General Motors began production of the Chevrolet Vega at their Lordstown Assembly plant in northeast Ohio. The brand new production line was the fastest in the world, cranking out 100 cars per hour. Lordstown workers protested the speed of the line, and the lack of control they held over their own work. As Jefferson Cowie describes, “The workers balked at the speed and discipline by working strictly to rules, letting production slip by unfinished, pushing absenteeism and turnover to new highs, taking drugs and alcohol on the job, and engaging in a wide array of sabotage on the job.”* The situation led to a long strike, beginning in March 1972, and the press coined the term “Lordstown Syndrome” to cover the dissatisfaction many American workers felt toward the quality of their jobs in the early 1970s. The change in attitudes among workers at Lordstown is not surprising, considering the near collapse of GM in 2009, but the stark contrast between how auto workers see their jobs in 1971 and 2010 is hard to ignore. What I’m trying to do here is to get a handle on the events and forces which have convinced American workers that holding onto their jobs outweighs most other concerns about the actual quality of their working lives. Of course, in many cases, this isn’t true, but in coal mining and many other industries, workers have been forced to abandon issues on which they would have fought management and their own unions tooth and nail in the late 1960s and early 1970s. The 40 years since the Chevy Vega went into production have reshaped the workplace for every American worker, in terms of the work they do, their relationship with their colleagues and employers, and in the value they and others place on their labour. I’ll try to explain how some of this happened in future posts.